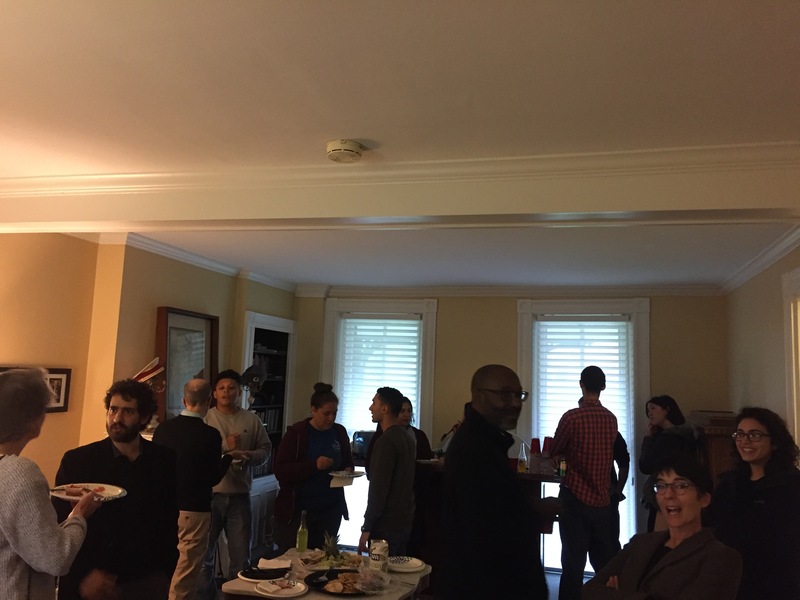 LALC hosted its first Café with majors, administrative assistant, faculty, and prospective majors on Thursday, October 26. We enjoyed tacos, quesadillas, and casual conversation while drinking beverages from Latin America. It was a great opportunity to interact with each other outside the classroom. Majors got to know each other and were able to meet professors with whom they had not taken a course. 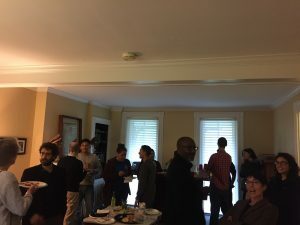 We are hosting our next LALC Café on Thursday, November 30th in Hartman House 5 to 6:30pm. A multi-disciplinary, introductory course designed to familiarize students with the regions through a study of their history, economics, politics, literature, and culture in transnational and comparative perspective. The purpose of the course is to provide a framework that will prepare students for more specialized courses in particular disciplines and specific areas of LALC studies. This interdisciplinary introduction to Africana Studies combines teaching foundational texts in the field with instruction in critical reading and writing. The course will cover Africa and the Atlantic Slave Trade, the creation of African Disaporic communities, the conceptualization and representation of Black culture and identity, and the intellectual and institutional development of Black and Africana Studies. The primary goal of this writing intensive course is to develop students’ writing skills in Spanish. Both in class and homework assignments approach writing as a process, and students will engage in drafts, peer editing, and revisions of their work. The course’s central aim is to help students in the development of ideas, creativity, organization, and basic research skills that shape strong academic writing. Throughout the semester students will broaden their lexicon and knowledge of Hispanic cultures through the critical analysis of film and literature. As we analyze various representations of sexuality, we will discuss what these expressions of pleasure and desire tell us about cultural practices, beliefs, values, and social institutions. In addition to readings, you will be asked to watch films outside of class. As Latinx population growth outpaced African American population growth over the course of the 2000s, a discourse of conflict and competition between the two groups started to take center stage. Scholars, journalists, and pundits argued that the new status of Latinxs as the “majority minority” population in the United States would diminish Black political and economic power and further exacerbate tensions between African American and Latinx groups. This course troubles sensationalistic accounts of Black and Latinx conflict by focusing on what interactions between African Americans and Latinx groups illuminate about race and power relations in the United States. We will focus special attention on the history of coalitional organizing between African American and Latinx groups, as well as the ways that Afro-Latinxs challenge narrow understandings of both Blackness and Latinidad. Ultimately, students will learn about the shifting history of racial power relations in the United States and the coalitional efforts undertaken by marginalized groups in order to affect social change. This course examines the constructions, lived experiences and politics of race, ethnicity and hybridity. The course will explore the historical evolution of the concept of race, the ways in which race and ethnicity are overlapping classification categories that are embedded in relations of power, and the social, cultural and biological outcomes of extended contact and mixture. Whereas the majority of scholarship on race and ethnicity considers the dynamics of these social scientific categories and processes of formation through the lens of interactions between a dominant group (usually occupying the racial category of white) and a subordinated or minoritized group (usually racialized as black or brown), this course shifts the gaze to the politics of race and ethnicity between historically oppressed ethnic groups—those of African ethnic origin and those of various Asian ethnicities. Using case studies mainly from the Caribbean, but also from the US and Africa, we will examine the anthropological, sociological, literary, musical and filmic documentation and analyses of Afro/Asian mixture and will explore how racial identities, interethnic relations, gender, sexuality, religious practices, politics, and festivity have been influenced by mixing and creolizing processes. Across the world and throughout history, statistics have shown that men commit more crimes than women. However, in recent years women’s involvement with drug trafficking in Latin America has grown exponentially. The main goal of this class is to analyze women’s diverse and complex participation in drug trafficking while developing writing skills in Spanish. How are women represented? What are women saying? Does women’s participation in drug trafficking challenge traditional rules and values? Are traditional notions of femininity and masculinity redefined? Students will read testimonials and interviews and will compare them to short stories, films, and songs. The course content will mainly focus on Mexico. This course will examine how the increasing diversity of audiences, voices, and participants in popular culture point to deficits, needs, and changes in American culture. 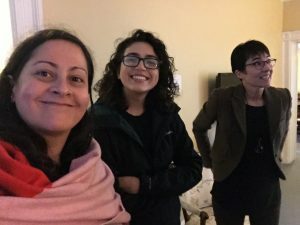 Focusing specifically on Latinas/os, we will analyze representation of Latinas/os in a variety of different genres – music, film, sports, and television – for what they tell us about race, gender, class, sexuality, citizenship, and language. We will look particularly at how Latinas/os negotiate mainstream media representations and create new forms of culture expression. 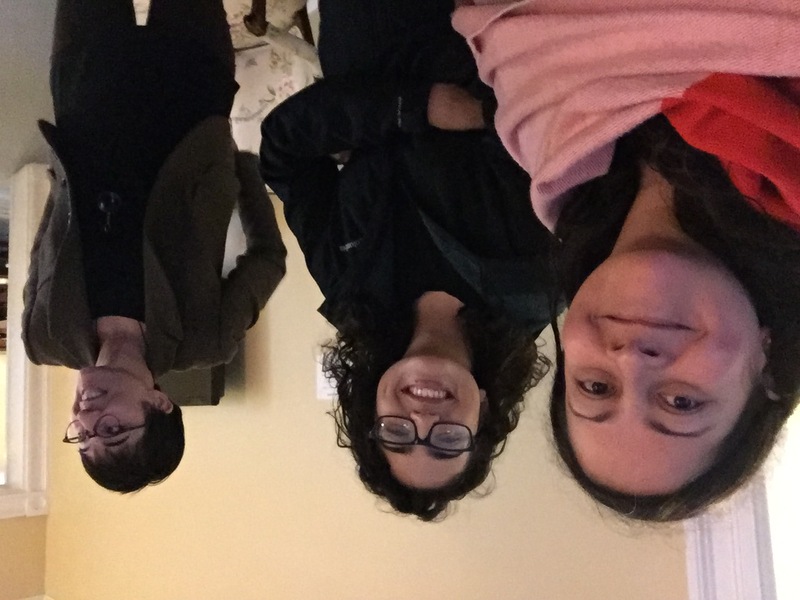 Exploring how Latinas/os produce media representations that defy both narrow understandings of Latinidad as well as dominant U.S. culture, class discussion will explore how identity is produced and contested through popular culture. This course will focus on developing students’ writing skills as we read a wide selection of Latin American literature, from the pre-Columbian period through the present. Emphasis will be placed on developing techniques for performing close readings and how to write a convincing literary analysis in Spanish. This course will examine human mobility since the middle of the nineteenth century by comparing different historical moments, societies, and experiences. The basic questions it seeks to address are: Why have people moved in different historical moments and across different spaces? How have they been received by other societies? What regimes of state control have emerged over time and why? Why have some migrants been welcomed as new citizens while others have been rejected as a menace to receiving societies’ values and culture? How have migrants accommodated to or challenged the reality of migration and transnational lives? It will include a wide variety of migrant experiences, such as labor migrations, migrations in imperial and post-colonial spaces, family migration, and displaced peoples and refugees. 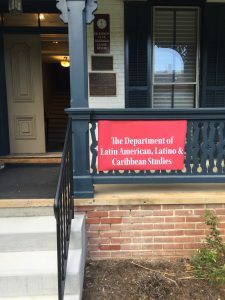 This interdisciplinary introduction to Latina/o Studies discusses foundational historical, cultural, political, artistic, and literary texts of the U.S. Latina/o community. This class will cover diasporic movements and issues of identity, with a particular focus on the Mexican, Puerto Rican, Dominican, and Cuban-American diaspora. We will explore how film and documentary media shape national subjectivities in their presentation of history, culture, gender, sexuality, and politics. We will further our inquiry through readings, both in English and Spanish, from books and scholarly articles. Students should expect to invest a significant amount of time on film viewings outside of class, assigned readings, and multiple writing assignments as they sharpen their ability to analyze film content and technique. Participation in the May 21-28, 2018 trip to Cuba will be open to anyone taking this class. MetaMovments will be organizing the trip with a focus on developing an historical understanding of the African influence on Cuban culture and life over several Centuries; engaging with academics & historians, specializing in the multiple branches of Afro-Cuban ancestry: Yoruba, Congo, Arara, and Abakua, as well as strong Haitian & Jamaican traditions; and being immersed in the dance and music of the island, from the Afro-Cuban roots to the Salsa of today. Students will be have the opportunity to practice Afro-Cuban music and dance with groups like Raices Profundo and visit the International Film School and talk with filmmakers. This course examines the history and politics of African American travel to Cuba from 1859 to 1960. Imagined accounts of African American travel to Cuba begin with Martin R. Delany’s novel Blake (1859) while actual African American travel to Cuba goes back at least as far as the Spanish-American War of 1898 and has continued unabated ever since. The history of African American travel to Cuba includes figures like Booker T. Washington, Langston Hughes, Rayford Logan, Mary McLeod Bethune, Sue Bailey Thurman, W. E. B. Du Bois, Irene Diggs, Joe Louis, and Amiri Baraka. In addition to the readings, students will listen to various podcasts, songs, and guest lecturers and watch relevant videos, documentaries, and films. Participation in the May 21-28, 2018 trip to Cuba will be open to anyone taking this class. MetaMovments will be organizing the trip with a focus on developing an historical understanding of the African influence on Cuban culture and life over several Centuries; engaging with academics & historians, specializing in the multiple branches of Afro-Cuban ancestry: Yoruba, Congo, Arara, and Abakua, as well as strong Haitian & Jamaican traditions; and being immersed in the dance and music of the island, from the Afro-Cuban roots to the Salsa of today. Students will be have the opportunity to practice Afro-Cuban music and dance with groups like Raices Profundo. After engagement with the history and politics of African American cultural exchange with Cuba and Cubans from 1859 to 1960, students will be able to reflect on their own experiences while in Cuba. LALC 300 – Pretty, Maidenlike, and a Housewife? In 2016 a Brazil’s right-leaning magazine published an article on the wife of Brazil’s vice-president, entitled “Pretty, Maidenlike, and a Housewife”. Subtly the magazine supported the idea that women do not occupy powerful positions. Instead, they must accompany a man. Unlike this stereotype (objected with a whole of outrage in social media), throughout the twentieth-century, a considerable number of Brazilian authors like Clarice Lispector, Marina Colassanti, Lygia Fagundes Telles, Adélia Prado, Guimarães Rosa, Patrícia Melo, Lya Luft, Sônia Coutinho, and filmmakers like Fernanda Vairelle, and Kléber Mendonça, among others have designed other destinies for the underrepresentation of women. Exploring themes like madness, eroticism, and aging, these authors subvert a set of beliefs that permeate the image of women insofar as reinstate women center-stage. We will study how a variety of authors believe that there is an overarching cultural background underlying minority or excluded groups. Therefore, this course aims at examining a broad range of Brazilian texts and films to understand how it is not homogeneity, but diversity, that pervades the cultures of social groups. This course will explore major literary and cultural trends in Spanish America Poetry from the Modernista and Vanguardia movements. The study of the concept of Modernity, its impact on humanity and the reaction of the intellectuals to it will be the main focus of the class. Emphasis will be given to poets such as Ruben Dario, Jose Marti, Delmira Agustini, and Jorge Luis Borges. Special attention will be paid to the connections of poetry and socio-politics in late Nineteenth-Century and early Twentieth-Century Spanish America. 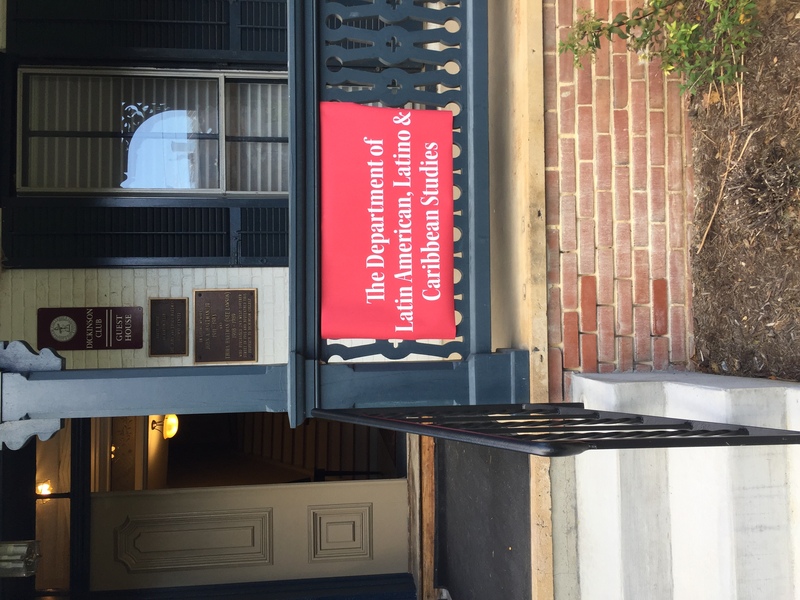 Research into a topic concerning Latin America directed by two or more faculty representing at least two disciplines. Students must successfully defend their research paper to obtain course credit. 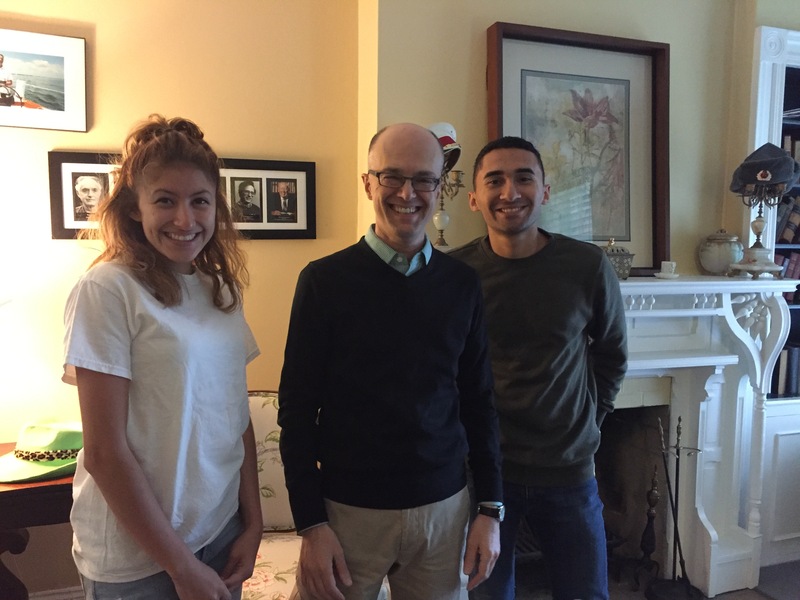 The paper is researched and written in the fall semester for one-half course credit and then defended and revised in the spring semester for the other half credit.